Prime candidates for slide-in modules are high-temperature reactors, which do exactly what the name implies: they generate steam at up to 1,000 °C, much hotter than the roughly 300 °C available from light-water reactors. This requires some radically different design choices, such as the use of helium gas instead of water to extract heat, and the use of a heat-resistant fuel made from oxides and carbides of uranium. Such reactors cannot melt down: the fuel is stable up to 1,600 °C, hundreds of degrees hotter than the core would become even if all power and coolant were lost. The high temperatures would make the reactors more efficient at producing electricity. And they could slash carbon emissions by supplying heat for industrial processes. In the United States, roughly 23% of all energy is used in industrial applications such as petroleum cracking and plastics manufacture, many of which need temperatures of at least 700 °C. Currently, those temperatures tend to be generated by burning natural gas; high-temperature reactors could provide a zero-carbon alternative. A number of commercial high-temperature reactors are under development around the world. But this year, a consortium of petrochemical companies and reactor manufacturers agreed to back the Antares high-temperature reactor design from the French company AREVA, based in Paris. “All that's left is about $800 million of work design and licensing effort required to get the technology to the point where the Nuclear Regulatory Commission could approve it,” says Fred Moore, head of the division that provides power and steam for the Dow Chemical Company, headquartered in Midland, Michigan. He estimates that this should take 5–7 years. If all goes to plan, high-temperature systems will be among the first advanced reactors to be deployed, starting in the 2020s. The image below portrays a basic light water reactor, with comments about more advanced reactor designs to the right of the image. Light-water reactors achieved their dominance not because they were best, but because they were first. Originally developed in the late 1940s as a compact power source for nuclear ships and submarines, the light-water design was adapted and scaled up during the 1950s, when the United States sought to put a peaceful face on atomic energy by creating a commercial nuclear-power industry. 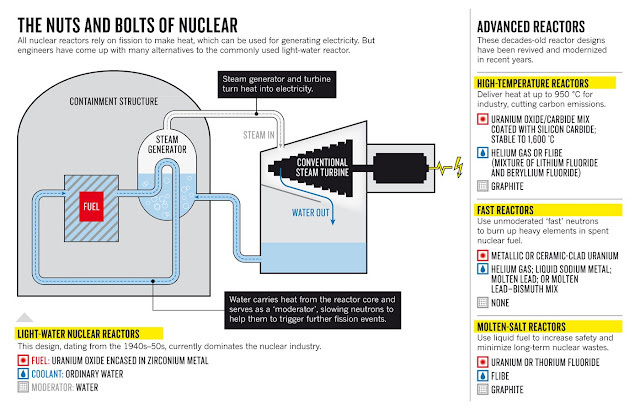 'Light water' is ordinary H2O, which flows through the reactor core, absorbs its heat and circulates it to a conventional steam turbine that turns the heat into electricity (see 'The nuts and bolts of nuclear'). Eventually, such reactors were meant to be part of a larger system that would make up for a basic inefficiency: left alone, any nuclear reactor will quickly poison itself. As the chain reaction proceeds, the fuel accumulates more and more of the fragments left over after the uranium atoms split, which in turn absorb more and more of the neutrons required to keep the reaction going. After perhaps 18 months, the fuel is 'spent' and has to be removed — even though it still contains much of its original energy. “So there was always this vision that there would be a recycled-spent-fuel infrastructure that would allow you to recover more of the fuel's energy,” says William Magwood, a former director of the Office of Nuclear Energy at the US Department of Energy (DOE) and now a member of the US Nuclear Regulatory Commission. A worldwide network of reprocessing plants would take the spent fuel, chemically extract the still-usable components — mostly uranium-235, plus the fissionable plutonium-239 formed when neutrons are captured by non-fissile uranium-238 — and then turn them into fresh reactor fuel. Ultimately, the plan was to transition to a new generation of 'breeder' reactors designed to maximize plutonium production. The only waste would be a comparatively small residue of intensely radioactive fission products that would decay within a few centuries, and could be disposed of in, say, a well-designed concrete bunker. But an anti-nuclear hysteria developed in the 60s and 70s which led to a curtailment of development of advanced nuclear reactors and reactor medleys. As a result of this faux environmental hysteria, the safer and more efficient ways of using nuclear fuels were never developed on a large scale, and thus the nuclear waste began to build and build and build. ...more radical designs might find an opening with the DOE's cost-sharing programme for Small Modular Reactor development, launched this year. That scheme's goal is to move away from the current multi-gigawatt nuclear plants, which can cost between US$10 billion and $15 billion to build, towards plants of 250 megawatts or less — small enough to mass-produce in a factory and ship to the intended site. Four reactor vendors, all with advanced light-water designs, competed for the award, which on 20 November went to a consortium headed by the Babcock and Wilcox Company of Charlotte, North Carolina. But other designs could also benefit, says Peterson. “If we can generate a market for light-water small modular reactors,” he says, “that makes it much easier to develop a market for prototype advanced reactors.” Power companies could experiment with the new technology by simply sliding in another module. If it works, great, says Peterson. If it doesn't, not much has been lost. “This lowers their whole risk threshold,” he says. More at link above, including a discussion of molten salt reactors. Another reactor design which should be included in the discussion, is the heavy water reactor such as the Candu Canadian design -- which can burn unenriched uranium more efficiently than light water designs can burn low enriched uranium fuel. Russia and China are each working on advanced generation nuclear reactor designs. In the free world, the NGN Alliance is promoting development of the high temperature gas cooled reactor, Candu is developing advanced heavy water designs, Flibe Energy is developing molten salt reactor designs, and a number of small modular designs are being developed. Seems to me that the High Temp Gas Cooled Reactor concept can be matched against the thorium molten salt rx. Both can generate the high temps needed for both thermally efficient electrical generation and the various high-temp apps. (Viz., S-I cycle for cracking water and making cheap H). Can the Al Fin cadre of engineers shed a little analytical light on which route to high temps might be the most practical/economical? It is too early to say at this time. Both approaches deserve much more development.